We have the lowest prices on the Internet. Our unlocking services permanently unlock your cell phone. Unlock your Orange phone in three simple steps. How to unlock my Orange phone with doctorSIM? Submit your unlocking request by selecting the country and the network provider to which your Orange phone is locked. We'll then send you via e-mail simple instructions on how to unlock your phone. Select the NCK option and type in the unlock code received from doctorSIM. Congratulations! Your phone is now unlocked and can be used on any compatible GSM network in the world. Can I still unlock my Orange phone if I don't know the exact model? Yes, you don't need to know the exact model of your cell phone as our unlock code and instructions are valid for all models. However, if you need to know this information for any other reason you can find out using our identify model check. Delivery times for unlocking Orange devices depend on the country and the network provider the phone is locked to. The exact delivery time will appear on the screen when you provide those details. However, it is possible to receive your unlock code prior to the deadline and we even deliver on weekends. Will unlocking my Orange void the warranty? Will an unlocked Orange cell phone work on any network in the world? 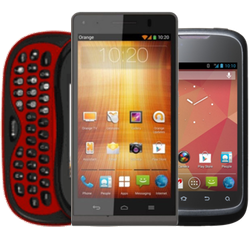 An unlocked Orange cell phone will work on any compatible GSM network in the world. You will not be able to use it on the few carriers using CDMA technology. Will my Orange lock again to the network if I update the software or restore it to factory settings? You have nothing to worry about. Whether you update the software or restore the phone to its factory settings, your cell phone will never lock again. Our cell phone unlockings are 100% permanent. Will I get my money back if you can't unlock my phone? In the rare event your Orange cell phone cannot be unlocked for any reason under doctorSIM's responsibility, we will return your money. No questions asked! Do you unlock blacklisted phones? Yes, but keep in mind that unlocking the phone does not remove it from the blacklist. These are additional security measures that can only be removed by the network provider. The unlocking instructions will work for a blacklisted phone, however, for it to work properly it must be removed from the blacklist. Check now if your phone has been blacklisted. Unlocking your Orange phone online at doctorSIM is legal and permanent. No technical knowledge is required to either submit or complete the unlocking process. Multiple 100% secure payment methods available to you. No need to restore or update your software to unlock your phone. Unlock your Orange phone fast with doctorSIM and avoid waiting in line at a local store. Professional IMEI-based unlocking services for all Orange models. Easy step-by-step instructions delivered around the clock via an automatic server. Unlock your cell phone yourself by simply typing in an unlock code.